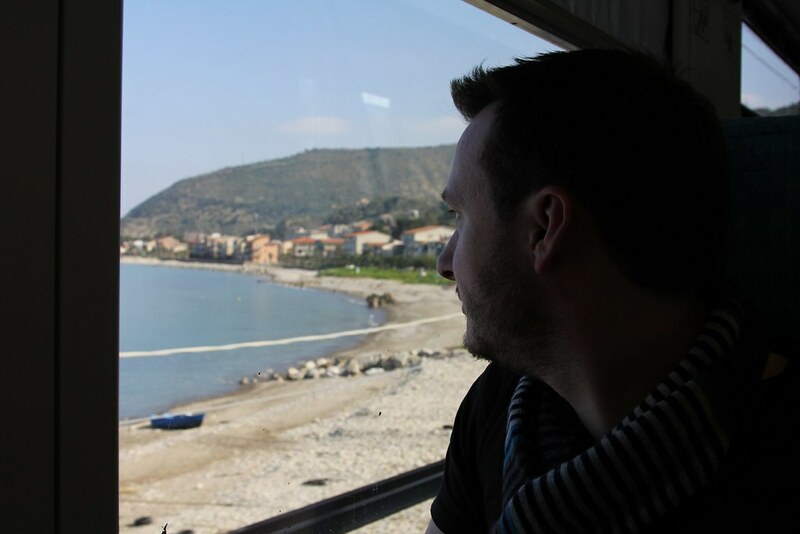 The next day saw a large handbag being taken to breakfast and several yogurts, nutella and bread rolls falling into it; this was because today would be 4 hours on a train day as we travelled from Palermo to Taormina, the second leg of our journey. Some confusion between us and the ticket-master existed because our pigeon Italian couldn’t explain why we were exclaiming that he was trying to charge us €10 more for a ticket than the ticket machine was. (The ticket machine wouldn’t accept €50 notes) A trip to an angry newsagent solved this conundrum. It’s the same journey as yesterday for the first 50 minutes at least, which is a pretty saunter along the coast. The reason for the cheap machine tickets becomes apparent on our last leg of the journey, as we played with the fully reclining seats, the angry ticket inspector informed us that our ticket was valid for local trains only. He disappeared mysteriously, giving us the impression that we had gotten away with it, before returning with a jabby finger and a demand for 20 euros. Grumble grumble. We arrived in Taoromina, which looked like a lovely seaside town, skipped past the Italian Watchtower magazine toting lady, and got a bewilderingly good rate for a taxi (or so the horror stories of the Internet and Italian taxi drivers..) to our hotel. The Continental must have once appeared stunningly well fitted. However, now it looks dated, but the room is clean and the man behind the desk is friendly. 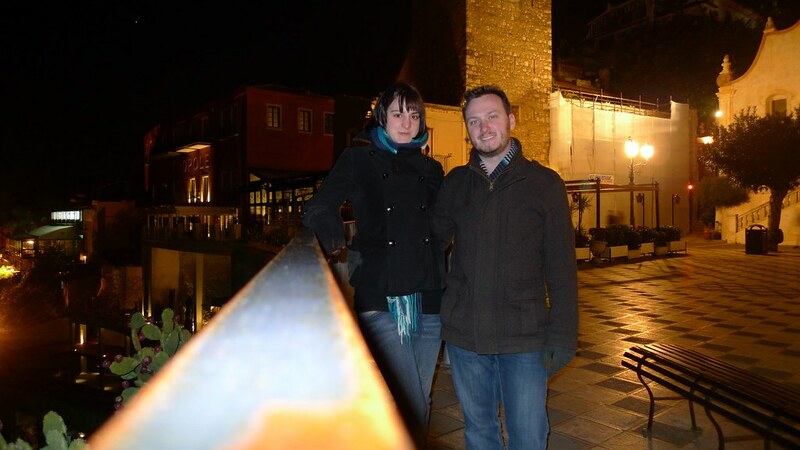 We skim the guidebook for restaurants and go on a wandering tour of the little town. The streets are a lot more polished than in Palermo, and it seems that in the off season everywhere holes at being patched and new paint applied. The shops all look very upmarket, and the whole town has an air of being on it’s best behaviour as guests are coming round. We visit a church, and potter round. 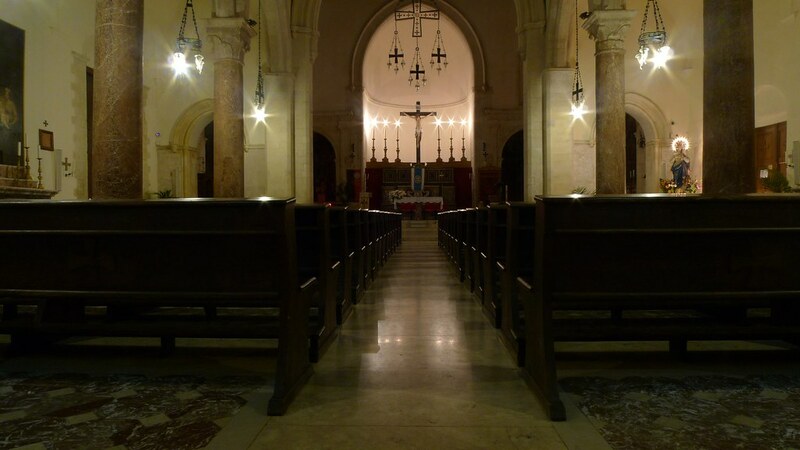 It’s much like any catholic church, but looks charming in the half-light. There were few other tourists on the streets, an even fewer in he restaurants. 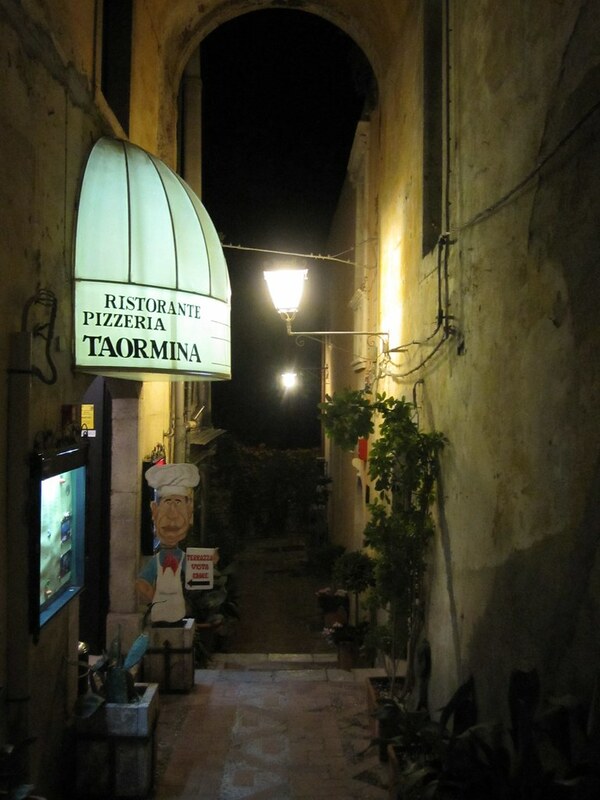 In the end, to avoid sitting in an empty room full of tables, we lazily followed an American couple into a restaurant that described itself as Trattoria Pizzeria Taormina. The waitress and waiter combo turn out to be charming, an the food lovely. Steak was had by her and I the swordfish, reversing our previous restaurant orders. I have still not got around the whole ordering two main courses either.. seemingly calling one of them the first (primi) course seems enough to justify it! Delicious food was had, and we bimbled back to our abode. Today we took the bus to Monreale.